From elementary schools to psychotherapy offices, mindfulness meditation is an increasingly mainstream practice. At the same time, trauma remains a fact of life: the majority of us will experience a traumatic event in our lifetime, and up to 20% of us will develop posttraumatic stress. This means that anywhere mindfulness is being practiced, someone in the room is likely to be struggling with trauma.At first glance, this appears to be a good thing: trauma creates stress, and mindfulness is a proven tool for reducing it. But the reality is not so simple.Drawing on a decade of research and clinical experience, psychotherapist and educator David Treleaven shows that mindfulness meditation--practiced without an awareness of trauma--can exacerbate symptoms of traumatic stress. Instructed to pay close, sustained attention to their inner world, survivors can experience flashbacks, dissociation, and even retraumatization.This raises a crucial question for mindfulness teachers, trauma professionals, and survivors everywhere: How can we minimize the potential dangers of mindfulness for survivors while leveraging its powerful benefits?Trauma-Sensitive Mindfulness offers answers to this question. Part I provides an insightful and concise review of the histories of mindfulness and trauma, including the way modern neuroscience is shaping our understanding of both. 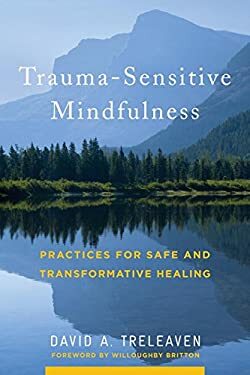 Through grounded scholarship and wide-ranging case examples, Treleaven illustrates the ways mindfulness can help--or hinder--trauma recovery.Part II distills these insights into five key principles for trauma-sensitive mindfulness. Covering the role of attention, arousal, relationship, dissociation, and social context within trauma-informed practice, Treleaven offers 36 specific modifications designed to support survivors' safety and stability. The result is a groundbreaking and practical approach that empowers those looking to practice mindfulness in a safe, transformative way.